Wow, I can't believe this book is 50 years old! Just goes to show how excellent books really stand the test of time. 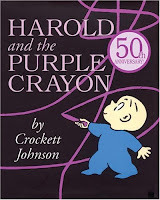 Harold's purple crayon can draw pretty much anything and it's suddenly real. 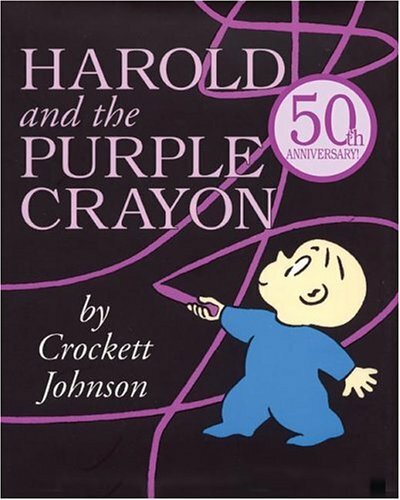 An ocean he gets immersed in, a ship in which to sail across it, pies to eat, and a hungry moose and deserving porcupine to polish off the pies, all spring from Harold's active imagination and endless purple crayon. 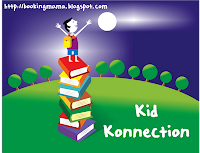 In an era when creativity is not encouraged at all, this book is incredibly important for children. And it's an ideal bedtime book. Not only does it suggest many fun dreams, but it ends with a tired Harold (who spends the whole book in his footy pajamas) looking for his bedroom so he can go to sleep. The illustrations are very simple, especially Harold's part. Harold himself is drawn more detailed, although he is the only thing in the whole book that appears in that style. His expressions don't change much but are impactful when they do. He doesn't talk. It's a simple and quiet book, but at the same time it's amazingly creative and expressive. A beloved book from when I was a child, this book has certainly held up. I hope it's around for another 50 years! I bought this book at a Borders going out of business sale. I don't remember this book from my childhood but my husband had it. We bought it right away when we had our first child! Wow -- 50 years! I'm older than this book, and unbelievably have never read it. I have always loved this book. It still holds up after so many years. What a great book about the power of imagination. And purple is my favorite color!